What is often passed off as a negligible and readily available asset could be something that another person was eagerly waiting for. As students, reading forms a crucial part of our academics. However, for a person who is visually impaired, the path to obtain a formal education is wrought with difficulties like dependency on persons with normal vision or awaiting the availability of Braille versions of books. The World Health Organization estimates the population of visually impaired people as around 285 million. Yet, it is saddening to see that our technological advancements have not really been able to help them much. Until now. 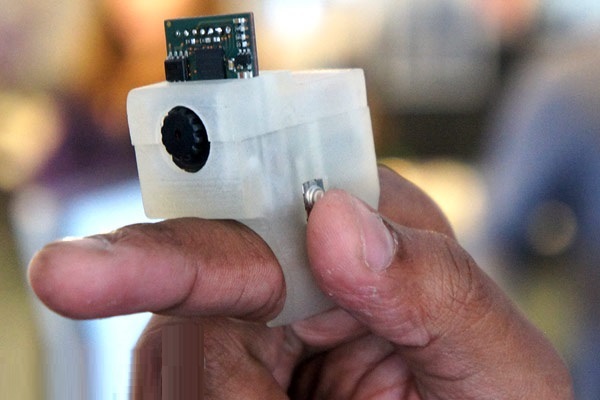 The Fluid Interfaces group of Massachussets Institute of Technology(MIT)’s Media Lab has been working on a character reader that can fit on a person’s finger and can read text (off a surface) out loud as well as give signals to them. 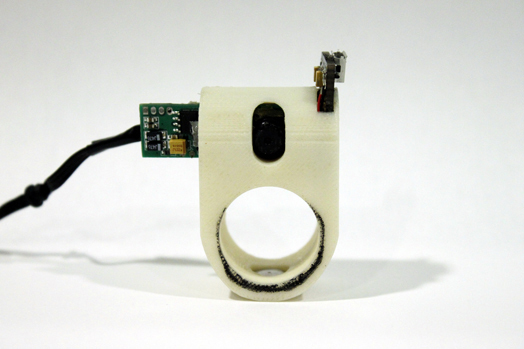 Termed “FingerReader”, the promise of this technology in aiding the visually impaired is in itself a noble cause. However, as scholars of wearable technologies, we need to look at the pros and cons of their design and what could be done to improve upon it. Looking at the device, the immediate opinion that springs up is on the aesthetics. The ring seems overly bulky and we can see that there is a chip on one side and a wire that connects to a computer on the other. Having seen the extent of minimizing size whilst improving on the presentability of products, we can immediately say this is still in its development stage. However, when looking at the functional aspect of it, we find that there is much more than meets the eye. The technology seems to rely on a camera fitted on the device that sends in visual input to the system as the finger moves along the surface. Software then identifies spaces and characters and attempts to pronounce the same based on phonetic rules that have been pre-programmed. Although I am not sure about the voice, I think it is safe to assume that it is coming from the system’s built-in speakers and have a robotic echoing effect that would need to be worked upon. The speed of processing is not at the levels we are used to experiencing with the technologies we utilize everyday but, considering the amount of processing that needs to be done with each movement, the speed is appreciable. The Fluid Interfaces Group has put up a demo on their website which I have embedded below. In the video, we can see that, although slow, the system is able to recognize and pronounce words accurately. The sensors and signals sent to show the ends and starts of lines are a thoughtful addition. The wearer doesn’t seem to feel the weight of the reader much and this is a sign that with future iterations, the size can definitely be scaled down even more. The group promises bluetooth enabling as well as mobile pairing options. It looks to be seen how much longer it will take to get all these implemented with the basic functional prototype. The group seems quite confident in their ability to sell and we can hope their pricing will be kept in a range that is affordable by a section of people who might not be economically well off.